The Access Password option allows you to configure passwords so either the user or the administrator has access to the settings area. To set a global password or change the password for the connection click on Change Password. Type in the password you want to use for this computer then click OK to confirm. Check the One time password checkbox. Click the Generate Passwords button. Select a location to save this file. The file contains 50 generated one time passwords for this computer. The connection password (if set). The required one time password (e.g. 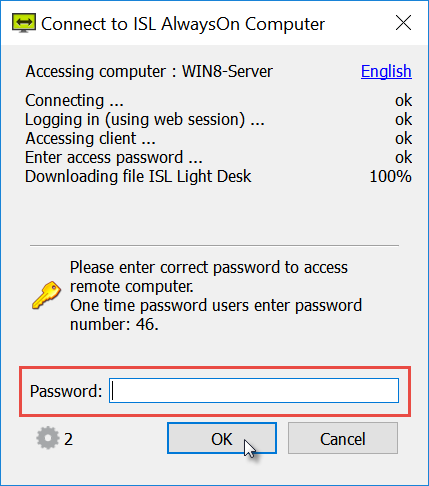 you will be prompted for the one time password number when the ISL AlwaysOn starts to connect to the remote computer). 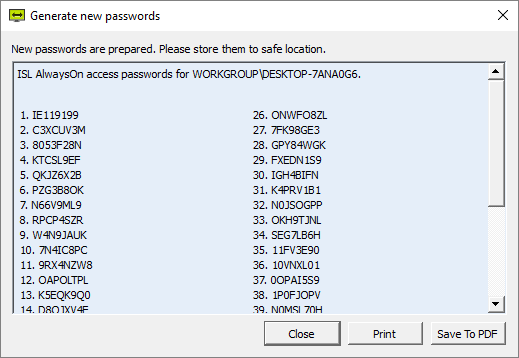 Important: We recommend you save a copy of the One time passwords list for when you want to access to the computer. You have the option to Save To PDF or send the list to the printer. The purpose of the global password is to stop the users accessing the AlwaysOn settings for security reasons. The administrator is normally the only person who has access to this password so he can make changes to the connection. If you type in the incorrect global password, the password box disappears. 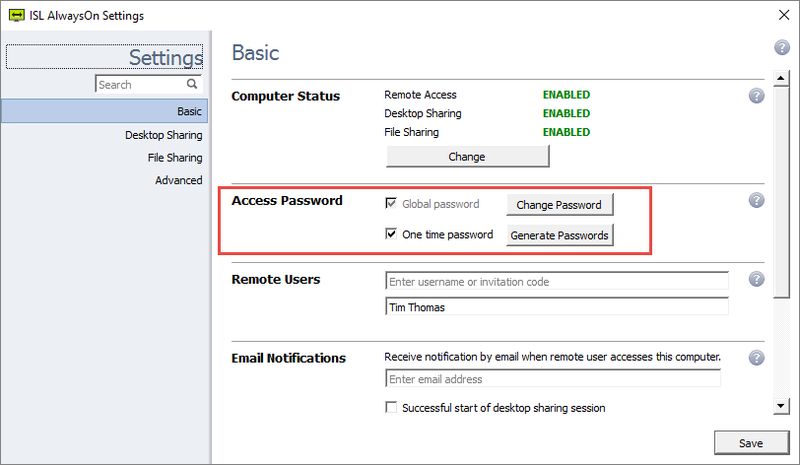 To re enter the global password you need to right click on the ISL AlwaysOn icon in the system tray > Click Settings. The administrator of the connection to this computer sets the security to use a one time password upon connection to the computer. In order for the supporter to connect they will need to enter the one time password. Important: You can also access the AlwaysOn list of computer via our website. Right click on the ISL AlwaysOn system tray icon > Click "Open". This will bring up the ISL Online Login Box. Login to your account using your ISL Online Username and Password. Find the computer you wish to connect to from the list. ISL AlwaysOn Connect will now download in your default Internet Browser. Click "Run" to start the process. ISL AlwaysOn connect will now load on your desktop. Once it has loaded and starts connecting to the computer, it will ask you to enter the One time password. In this example it is asking us to enter one time password number 46. Refer to the list of one time passwords and enter the correct code into the Password box as shown above. Click "OK" and if it accepts the password your connection will be established.